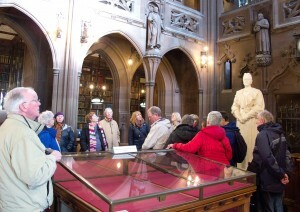 Rain and hailstones greeted 43 members of u3a Todmorden’s let’s go group on their walking tour of Manchester recently. Members had an introductory talk in the Old Pump House engine room of the Peoples History Museum, in the Spinningfields district of Central Manchester. 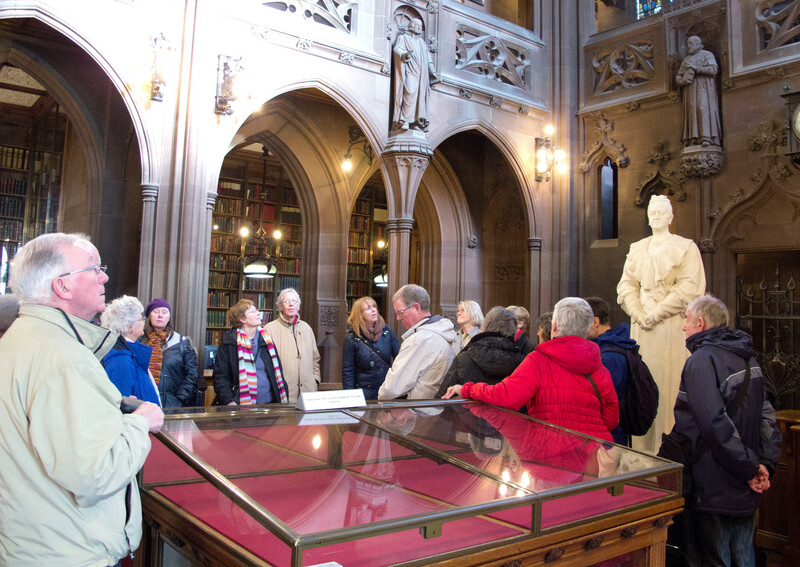 Led by two blue badged guides, the groups then moved on to the John Rylands library and were shown fragments of an early copy of the Bible and the eyes of the John Rylands, a shy cotton millionaire, left for scientific research. One of the guides commented that, in her opinion, everyone should spend a day in this magnificent building, with its thousands of books. The tour ended at the town hall, where the group were told that Queen Victoria declined to attend the opening of the building. Apparently the then mayor Abel Heywood had too radical a past for her. Still his name lives on: the town hall’s bell, inscribed AH, is the Great Abel!